UPDATE: So many of you have looked at this pattern, I'm wondering....have you made one? How did it go? Would you be willing to share photos? Please leave a comment, or email me and let me know! I had some time today to finish up my Halloween costume preparation, and created a new pattern for making a pioneer sunbonnet. I have a little sunbonnet I wore as a small girl (as modeled by Baby, above), and used it as a pattern to make a larger one for my first-grader who wants to be Kirsten from the American Girls. I figured I'd take photos as I made the bonnet, and would share the tutorial with any who might need it. Enjoy! For this project, you will need 1/2 yard cotton print of your choosing, matching thread, and 5 1/2" inches of 1/4" braided elastic for the preschool size, OR 7 1/2" inches of 1/4" elastic for the schoolgirl size, and 1/4 yard iron-on medium duty interfacing. You'll also need pins, scissors, and your iron. Additional tools that will be helpful are a bias tape maker, rotary cutter and mat, seam ripper, and a contrasting fabric for the bias tape. Print out your pattern, and then cut out the required pieces. You will need to cut two pieces for the bonnet visor, two pieces of interfacing that match, one bonnet back piece, a strap piece that is 1" X 30", and a bias strip that is 2" X 17". I forgot to mention on the pattern, but all seams are 1/4". Topstiching is at 1/8" or less if possible. Being careful not to burn yourself, fold the chin strap in half, then iron each side to the center, and then iron the whole thing again. It should be 1/4" wide when you are done. Topstitch the strap to finish, and then set aside for now. Be sure when you pin the visor pieces together, you tuck the straps in at the markings. The strap shouldn't be twisted, and should be inbetween the right sides of the fabric, with just 1/8" sticking out of the seam. Step 7: Take a deep breath, shrug your shoulders, and roll your head a few times. You're doing great! Step 9: Fold the bottom of the bonnet piece up 1/4" and iron, then repeat. Sew just under1/8", and you've created the casing for the elastic. Cut your elastic to the right size, and put a safety pin on one end. Thread through the casing until the end is barely showing, and sew the end in place. Continue to thread through until safety pin is out. Take off pin, and secure other end by sewing it down. Step 10, the fun part, gathering the bonnet. The easiest way to gather is to tighten the tension on your sewing machine (I put my Bernina at a 9, and usually keep it at 5). Widen your stitch length to the widest setting, and sew two seams at 1/8" and 1/4". You won't even have to pull the threads to gather. The machine does the work for you. Step 11: Pin the bonnet to the visor, and sew it together. I tried to keep the gathers minimal at the beginning and end, concentrating them at the middle portion. Be careful to backstitch at the beginning and ending of the seam. I like to sew with the gathered side up, so I can make sure the gathers are being sewed nicely, and not getting bunched up in the wrong places. Whoever thought of the bias tape maker, THANK YOU!!! I love this tool. It makes creating your own bias tape so easy. I bought mine at Fabric.com. If you don't have one, no problem! Just use the same method as I used for the chin strap. When I sewed on my bias tape, I used the same method I use to bind quilts. I opened up the tape, and pinned it so it was just over 1/4" from the edge. I use the iron mark for a sewing guide, and carefully sew down that line. Then, I fold the bias tape over so it covers the seam, and pin it in place. I use a blind-hem stitch and hand-sew the seam closed. The end result looks very tailored. All finished! I hope that this is helpful to you. I'd love to know if you use this pattern. I might just have to start my own Flickr pool! This is so great! Perfect for a Pioneer Day! Hey Chris, not sure if we've talked about this before....but you and I have the EXACT same sewing machine! Awesome! I love it. I have a Bernina serger as well. I'm french and love so sewing. It's a cute bonnet ! Please can you send me the pattern ? I hope you don't mind me linking! Like I said - I wish I would have found this before I went to the effort to make up a pattern! I'm going to try and put up an authentic one . . . eventually. It's interesting because the thing people seem to be mainly searching for are bonnets! Jude, your kind words made my day! I wish you a quick recovery, and when you get that bonnet made, I want to see pictures! Just found you from Laura's blog. LOVE this tutorial! Can't wait to try it. My daughter just had to have a "Little House on the Prairie" birthday this year, and loves pioneer stuff. We have one dress and hat like Laura Ingals that my mom made me when I was her age, but we need another smaller version for little sister. This bonnet looks even easy enough for me to make her one myself. Thanks! Hi, just made two of the sun bonnets yesterday for my girls Laura & Mary Ingalls costumes. Your instructions were very easy to follow and they turned out nice. Only thing I would change is to make a ruffle along the bottom of the elastic on the back, a kind of neck shield. I had more than a few people think my girls were little Quakers or Mennonites instead of Little Girls on the Prairie, lol. I've been looking for a pattern for my niece! Thanks so much! Thanxs a lot for this pattern ! I made it yesterday, I show mine on my blog on friday. So cute, so funny ! I have been looking for a tutorial to make this type of bonnet, like forever. I'm so excited about this. I'll definitely post some pics when I make one. Thanks! Just got done making this, and it took less than 2 hrs! I made the preschool size for my 3 year old, and it seems kind of small though. I may make the bigger size for her and see which one fits better. Also, I just used some double fold bias tape for the chin strap. Saved my fingers from the iron. :) Used the bias tape for the seam too. Perfect for the Pioneer Day parade. Hello! 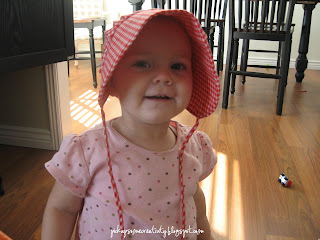 I found this post by searching "how to make a sun bonnet"! This must be the season of preparing for Halloween! I too am researching bonnets for Laura & Carrie Ingalls! If I make them, I'll post them on my blog! Your sunbonnet pattern was such a blessing! I really had a hard time finding one at the fabric store or on-line. Your pattern was wonderful. I made 10 bonnets in one day for my daughter's Pioneer themed birthday party. I bought an old sheet from a thrift shop for the fabric. They turned out really well. @FionaI'm so glad it was helpful for you! Best wishes! Hi, wondering if you would be willing to upsize this to adult size, I would love to make one for myself, I take a medication that makes me very sensitive to sun and can't find a hat that covers enough, or accommodates longer hair . I am horrible at adjusting patterns however. HI, I LOVE SEWING AND YOUR TUTORIAL IS PRETTY GOOD !! COULD YOU PLEASE SEND ME THE PATTERN OF THE BONNET? I HAVE UNDERSTOOD THE VISOR FORM, BUT I HAVENT UDERSTOOD THE BONNET DRAWING. DOES IT HAVE THE SAME FORM OF THE BONNET? @PatriciaPatricia, the bonnet portion is just a rectangle (cut to the size you need either 11x9" or 12x10") and then the corners are rounded as shown in the shaded portion. If have trouble downloading the pattern, let me know. I would be so grateful! Where I live we have a Founder's Day Parade every year in May. I want to make my 5 year old granddaughter at pioneer outfit. Thanks. I could not download your pattern. Would it be possible to have you email it to me? Thank you SO much for sharing! I'm making pioneer (real life) dresses for twin girls and wanted to find a nice bonnet pattern to match. I believe this is going to be great! Thank you for the pattern! I made the school girl size and may have used more like 3/8 seam allowance and it was a little small for my 8 year old. Lucky for me I have a 3 year old too! It was a good fit on little sister with room to grow. Now I will enlarge the pattern for the 8 year old. I love the big visor, and using the bias tape was great! Nice pattern! Is this for a kid or a grownup?